Lionel Conacher nicknamed The Big Train! 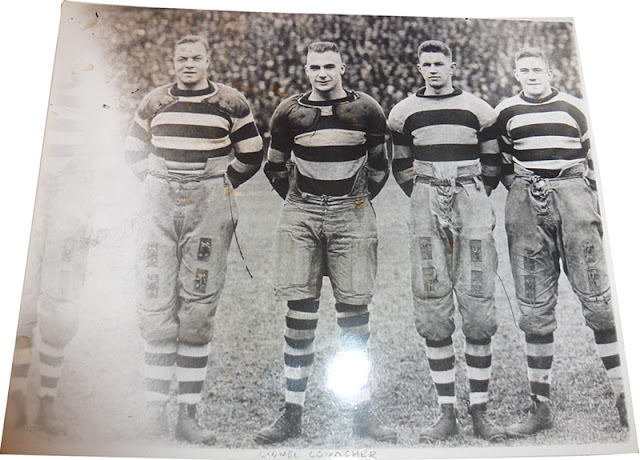 who was designated Canada's Athlete of the Half Century in 1950, knew a thing or two about translating his athletic ability into $$$ despite the prevailing atmosphere in his era that all Rugby-Football north of the border was supposed to be strictly amateur. 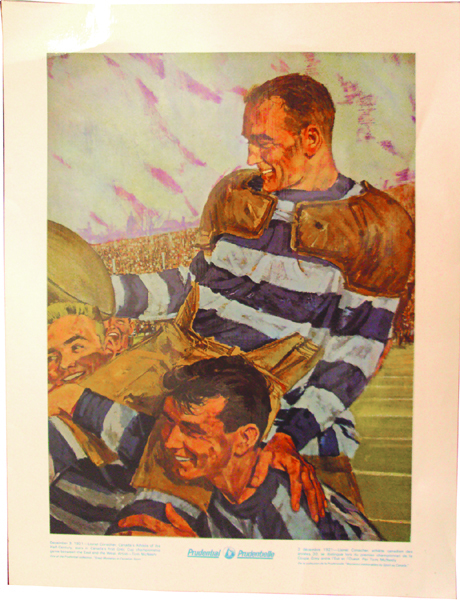 I listed his 1924 Dominion Chocolate sports card in Volume I of Collecting Canadian Football because it is generic and does not show him in any particular sport's equipment and in 1924 he was probably better known for his gridiron exploits leading the 1921 Argonauts to the Grey Cup, than for his hockey talents since he had yet to play for any NHL team. 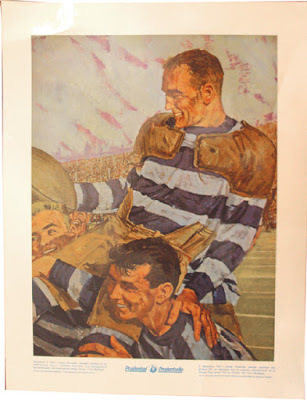 The exact uniform and pads Conacher wore for the Argonauts were replicated in 1956 in a painting commissioned for the Prudential Insurance Company and eventually issued as a poster in multiple formats in different decades. Specifics on these issues can be found in Volume I although some details remain to be be determined. 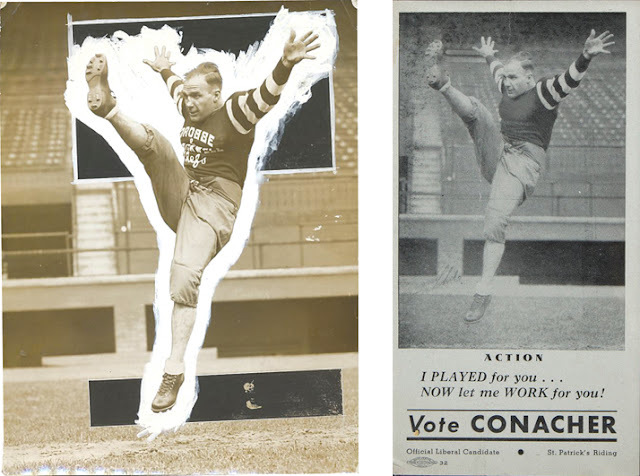 Conacher started a 13 year Hall of Fame caliber NHL career in 1925 but what most people don't realize is that at the creaky old age of 33 he also organized, promoted and starred for the first professional team in Canadian Football History. The team was called the Crosse & Blackwell Chefs as it was sponsored by the Crosse & Blackwell food production company. 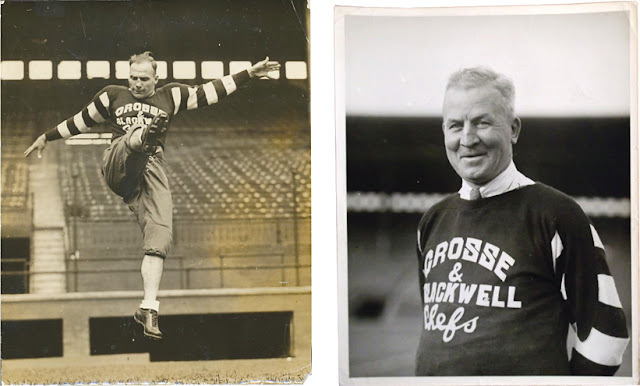 It was an independent team unaffiliated with any league and it played only three games in 1933 (two home, one away). 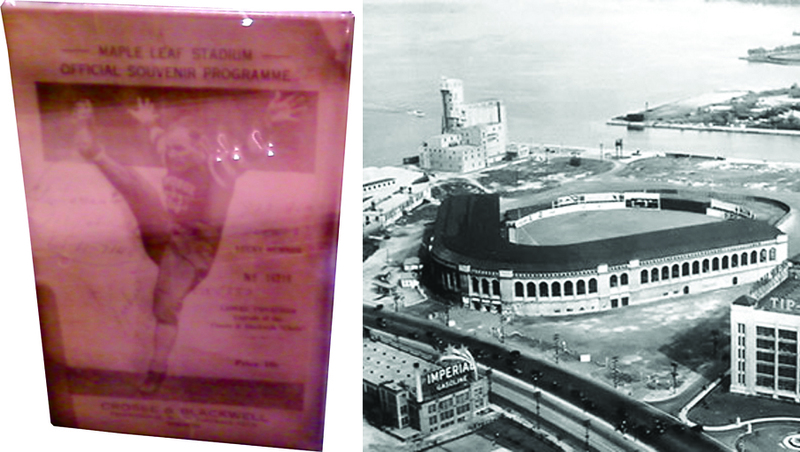 Poor quality image of one of the two produced Crosse & Blackwell Chef programs from Maple Leaf Stadium. The stadium was built for baseball but could be configured for football as well. 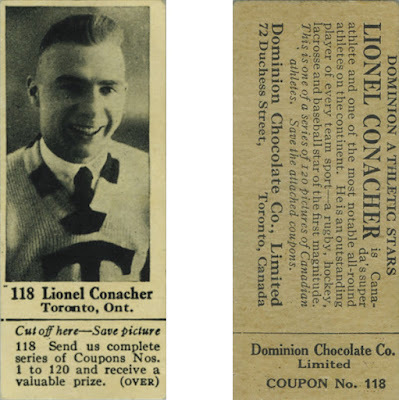 Conacher was a savvy promoter and he made sure that Alexandra Studios of Toronto took plenty of media photos of him kicking and running the ball and he used those images for program covers as well as in advertisements of products he was spokesman for. 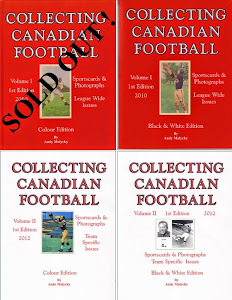 Some of these photos are catalogued in Collecting Canadian Football Volume II. Since the Chefs opponents were American semi-pro independent teams (the Rochester Arpeakos and a Buffalo club whose name is not certain) it is likely that the games they played would have been by American rules, however there is the chance that some local hybrid rules would have been in play for the Toronto games. 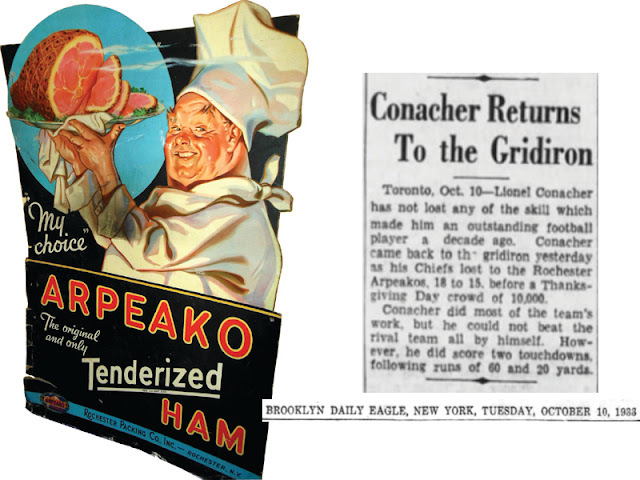 Information about the team's that faced the Chefs is hard to come by, presumably Conacher's four years with the New York Americans NHL team allowed him to make many contacts in the state and would also account for why this game was reported in a Brooklyn paper. 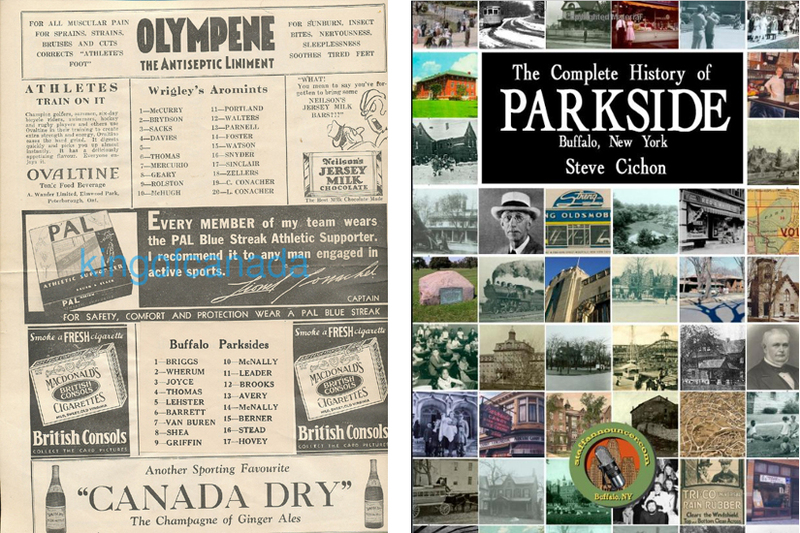 In fact there was a long tradition of semi-pro independant football teams upstate and according to The Encyclopedia of New York State: local semi-pro teams could attract 8,000 paying customers and interest in them often surpassed that for local professional NFL clubs. 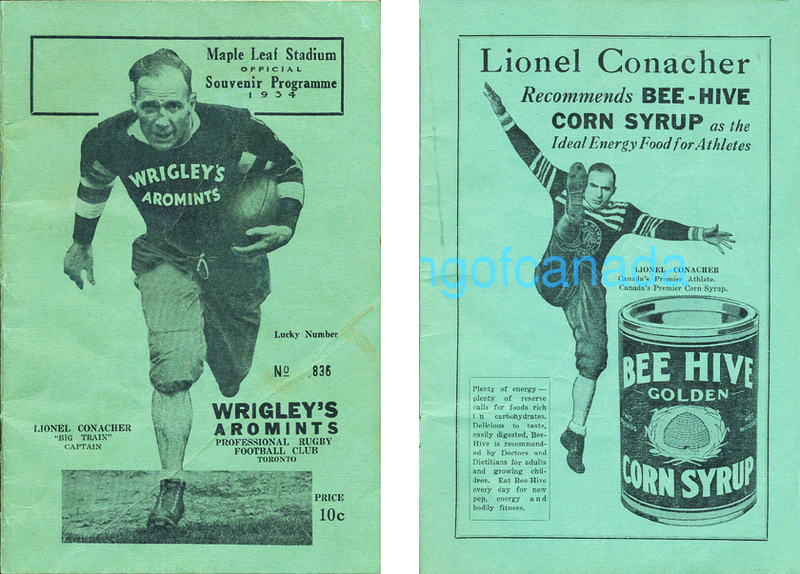 In 1934 Conacher gained new sponsorship so the team name changed to the Wrigley Aromints as this program versus the now Buffalo Parksides shows. Conacher is prominent hawking Bee Hive Syrup (kicking in his 1933 Chicago Blackhawks jersey!) as well as athletic supporters and probably numerous other things. I did not bother to remove the Ebay seller digital mark from the ad & lineup pages. The Buffalo team was likely named after a prominent Buffalo neighborhood although its possible it was also sponsored by a Buffalo candy company that is still in business today. Note that Lionel drafted his brother Charlie to play quarterback for the 'Mints (and Chefs). Not one to let good promotional material go to waste, Conacher reused some of his old football images while running for political office after his playing career was finally over. Thanks to Bobby Burrell for the images of the Conacher 1924 Dominion Chocolate card. Well I think that is enough vintage focus for a while, next post will feature the 2015 Upper Deck CFL cards.